The documents and files for this case are scanned and trascribed by the Marine Lives Project. They provide insights into the lives of the seamen and the trade economics of the 17th century. The question is whether it makes sense (possible and feasable) to build a link between Hamburg as it is depicted in MarineLives and the Chronoscope Hamburg showing the year 1694. 8-Dec-2016: I declare temporary victory. 60 mariners and merchants are mapped on the Chronoscope Hamburg v1.2. 19-Mar-2018: 60 mariners and merchants are mapped on the Chronoscope 2.5 Hamburg. 10193 pages out of 58 volumes have been scanned and transcribed. About 500 pages seems to be the maximum. Otherwise the file is truncated and is no longer a valid RDF document. Transcripts exported to RDF, then tranformed via XSL to be displayed as web pages. This provides a full-text search with ease. HCA_13-66-69_Silver 542 10th of November 1652 325 The Three Silver Ships. 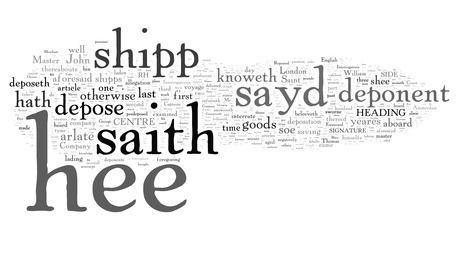 The entire HCA Volume No.70 put into wordle – I hope wordle can cope with the amount of text. [7 Dec 2016 experimental feature] All residents are marked on the map of 1694.
hard-coded array of objects with residetents. Streets are referenced. ToDo: disable MarineLayer for other years. [4 Dec 2016 experimental feature] All streets are marked on the map of 1694.
transcripts republished by volume on this site.